C. Fernández, J. Muñoz-Bulnes, D. F. Llorca, I. Parra, I. García-Daza, R. Izquierdo, M. A. Sotelo. High-Level Interpretation of Urban Road Maps Fusing Deep Learning-Based Pixelwise Scene Segmentation and Digital Navigation Maps Journal of Advanced Transportation, 2018 (JCR-IF-2017: 1.102; Q3). R. Quintero, I. Parra, D. F. Llorca, M. A. Sotelo. Pedestrian Path, Pose, and Intention Prediction Through Gaussian Process Dynamical Models and Pedestrian Activity Recognition IEEE Transactions on Intelligent Transportation Systems, 2018 (JCR-IF-2017: 4.051; Q1). C. Fernández, D. F. Llorca, M. A. Sotelo. A Hybrid Vision-Map Method for Urban Road Detection Journal of Advanced Transportation, 2017 (JCR-IF-2017: 1.102; Q3). I. Parra, R. Izquierdo, J. Alonso, A. G. Morcillo, D. F. Llorca, M. A. Sotelo. The Experience of DRIVERTIVE-DRIVERless cooperaTIve VEhicle-Team in the 2016 GCDC IEEE Transactions on Intelligent Transportation Systems, 2017 (JCR-IF-2017: 4.051; Q1). M. Jiménez, D. F. Llorca. CNN-based Vehicle Logo Classification for Vehicle Manufacturer Recognition. Atiner Paper Series, No. TRA2017-2275, 2017. D. F. Llorca, R. Quintero, I. Parra, M. A. Sotelo. Recognizing individuals in groups in outdoor environments combining stereo vision, RFID and BLE. Cluster Computing, 2017 (JCR-IF-2017: 1.601; Q2). D. F. Llorca, R. Quintero, I. Parra, C. Fernández, I. García-Daza, C. Allén, M. A. Sotelo. Assistive intelligent transportation systems: the need for user localization and anonymous disability identification IEEE Intelligent Transportation Systems Magazine, 2016-2017 (JCR-IF-2016: 3.654; Q1). A. G-Lorente, D. F Llorca, M. Gavilán, J. A. Ramos, F. S-Domínguez. Detection of Range-based Rail Gauge and Missing Rail Fasteners: Use of High-Resolution Two- and Three-Dimensional Images Transportation Research Record: Journal of the Transportation Research Board, 2015 (JCR-IF-2014: 0.544; Q3). D. F. Llorca, I. G. Daza, S. Álvarez, A. Martínez-Hellín, M. A. Sotelo. Parking assistance system for leaving perpendicular parking lots: experiments in daytime/nighttime conditions. IEEE Intelligent Transportation Systems Magazine, 2014 (JCR-IF-2014: 0.821; Q3). S. Álvarez, D .F. Llorca, M. A. Sotelo. Hierarchical camera auto-calibration for traffic surveillance systems. Expert Systems with Applications, 2014 (JCR-IF-2014: 2.240; Q1). D. F. Llorca, A. G. Lorente, C. Fernández, I. G. Daza, M. A. Sotelo. Automatic thermal leakage detection in building facades using laser and thermal images. Lectures Notes in Computer Science, 2013. C. Fernández, R. Domínguez, D. F. Llorca, J. Alonso, M. A. Sotelo. Autonomous Navigation and Obstacle Avoidance of a micro-bus. International Journal of Advanced Robotics Systems, 2013 (JCR-IF-2013: 0.497; Q4). C. Fernández, D. F. Llorca, M. A. Sotelo, I. G. Daza, A. M. Hellín, S. Álvarez. Real-time vision -based blind spot warning system: experiments with motorcycles in daytime/nighttime conditions. International Journal of Automotive Technology, 2013 (JCR-IF-2013: 0.821; Q3). D. F. Llorca, M. A. Sotelo, A. M. Hellín, A. Orellana, M. Gavilán, I. G. Daza, A. G. Lorente. Stereo Regions-Of-Interest Selection for Pedestrian Protection: A Survey. Transportation Research Part C: Emerging Technologies, 2012 (JCR-IF-2012: 2.006; Q1). I. Parra, D. F. Llorca, M. Gavilán, S. Álvarez, M. A. García-Garrido, L. Vlacic, M. A. Sotelo. Accurate Global Localization Using Visual Odometry and Digital Maps on Urban Environments. IEEE Transactions on Intelligent Transportation Systems, 2012 (JCR-IF-2012: 3.064; Q1). V. Milanés, D .F. Llorca, J. Villagrá, J. Pérez, I. Parra, C. González, M. A. Sotelo. Vision-based Active Safety System for Automatic Stopping. Expert Systems with Applications, 2012 (JCR-IF-2012: 1.854; Q1). M. A. García Garrido, M. Ocaña, D. F. Llorca, E. Arroyo, J. Pozuelo, M. Gavilán. Complete Vision-based Traffic Sign Recognition Supported by I2V Communication System. Sensors, 2012 (JCR-IF-2012: 1.953; Q1). J. J. Vinagre, D. F. Llorca, A. B. Rodríguez-González, R. Quintero, A. Llamazares, M. A. Sotelo. Extended Floating Car Data System: Experimental Results and Application for a Hybrid Route Level of Service. IEEE Transactions on Intelligent Transportation Systems, 2012 (JCR-IF-2012: 3.064; Q1). M. Gavilán, D. Balcones, M. A. Sotelo, D. F. Llorca, O. Marcos, C. Fernández, I. García, R. Quintero. Surface Classification for Road Distress Detection System Enhancement. Lecture Notes in Computer Science, 2012. S. Álvarez, M. A. Sotelo, D. F. Llorca, R. Quintero, O. Marcos. Monocular Vision-based Target Detection on Dynamic Transport Infraestructures. Lecture Notes in Computer Science, 2012. V. Milanés, D .F. Llorca, J. Villagrá, J. Pérez, C. Fernández, I. Parra, C. González, M. A. Sotelo. Intelligent Automatic Overtaking System Using Vision for Vehicle Detection. Expert Systems with Applications, 2012 (JCR-IF-2012: 1.854; Q1). C. G. Keller, M. Enzweiler, M. Rohrbach, D. F. Llorca, C. Schnorr, D. M. Gavrila. The Benefits of Dense Stereo for Pedestrian Detection. IEEE Transactions on Intelligent Transportation Systems, 2011 (JCR-IF-2011: 3.452; Q1). M. Gavilán, D. Balcones, O. Marcos, D. F. Llorca, M. A. Sotelo, I. Parra, M. Ocaña, P. Aliseda, P. Yarza, A. Amírola. Adaptive Road Crack Detection System by Pavement Classification. Sensors, 2011 (JCR-IF-2011: 1.739; Q1). P. F. Alcantarilla, L. M. Bergasa, P. Jiménez, M. A. Sotelo, D. F. Llorca, I. Parra, S. S. Mayoral. Automatic Lightbeam Controller for Driver Assistance. Machine Vision and Applications, 2011 (JCR-IF-2011: 1.009; Q2). D. F. Llorca, V. Milanés, I. Parra, M. Gavilán, J. Pérez, I. G. Daza, M. A. Sotelo. Autonomous Pedestrian Collision Avoidance using a Fuzzy Steering Controller. IEEE Transactions on Intelligent Transportation Systems, 2011 (JCR-IF-2011: 3.452; Q1). A. González, M. A. García-Garrido, D. F. Llorca, et al. Automatic Traffic Signs and Panels Inspection System using Computer Vision..IEEE Transactions on Intelligent Transportation Systems, 2011 (JCR-IF-2011: 3.452; Q1). J. Nuevo, L. M. Bergasa, D. F. Llorca, M. Ocaña. Face tracking with automatic model construction for a driver monitoring application. Image and Vision Computing, 2011 (JCR-IF-2011: 1.723; Q1). D. F. Llorca, I. Parra, M. A. Sotelo, G. Lacey. A vision-based system for automatic hand washing quality measurement. Machine Vision and Applications, 2011 (JCR-IF-2011: 1.009; Q2). D. F. Llorca, M. A. Sotelo, S. Sánchez, M. Ocaña, J. M. Rodríguez-Ascariz, M. A. García-Garrido. Traffic Data Collection for Floating Car Data Enhancement in V2I Networks. EURASIP Journal on Advances in Signal Processing, 2010 (JCR-IF-2010: 1.012; Q2). D. F. Llorca, M. A. Sotelo, I. Parra, M. Ocaña and L. M. Bergasa. Error Analysis in a Stereo Vision-based Pedestrian Detection Sensor for Collision Avoidance Applications. Sensors, 2010 (JCR-IF-2010: 1.771; Q1). I. Parra, M. A. Sotelo, D. F. Llorca, M. Ocaña. Robust Visual Odometry for Vehicle Localization in Urban Environments. ROBOTICA, 2010 (JCR-IF-2010: 0.939; Q2). D. F. Llorca, S. Sánchez, M. Ocaña, M. A. Sotelo. Vision-based Traffic Data Collection Sensor for Automotive Applications. Sensors, 2010 (JCR-IF-2010: 1.771; Q1). S. Álvarez, M. A. Sotelo, M. Ocaña, D. F. Llorca, I. Parra, L. M. Bergasa. Perception advances in outdoor vehicle detection for automatic cruise control. ROBOTICA, 2010 (JCR-IF-2010: 0.939; Q2). C. G. Keller, D. F. Llorca and D. M. Gavrila.. Dense Stereo-based ROI Generation for Pedestrian Detection. Lecture Notes in Computer Science, 2009. D. Balcones, D. F. Llorca, M. A. Sotelo, M. Gavilán, S. Álvarez, I. Parra, M. Ocaña. Real-time vision-based vehicle detection for rear-end collision mitigation systems. Lecture Notes in Computer Science, 2009. M. Ocaña, L. M. Bergasa, M. A. Sotelo, R. Flores, D. F. Llorca, D. Schleicher. Automatic Training Method applied to a WiFi+Ultrasound POMDP Navigation System. ROBOTICA, 2009 (JCR-IF-2009: 0.992; Q3). D. F. Llorca, M. A. Sotelo, I. Parra, J. E. Naranjo, M. Gavilán, S. Álvarez. An Experimental Study on Pitch Compensation in Pedestrian Protection Systems for Collision Avoidance and Mitigation. IEEE Transactions on Intelligent Transportation Systems, 2009 (JCR-IF-2009: 2.092; Q1). R. García, M. A. Sotelo, I. Parra, D. F. Llorca, J. E. Naranjo, M. Gavilán. 3D Visual Odometry for Road Vehicles. Journal of Intelligent and Robotic Systems, 2008 (JCR-IF-2008: 0.560; Q3). M. A. Sotelo, R. García, I. Parra, D. F. Llorca, M. Gavilán, S. Álvarez, J. E. Naranjo. Visual odometry for road vehicles—feasibility analysis. Journal of Zhejiang University – Science A, 2007 (JCR-IF-2007: 0.554; Q3). M. A. Sotelo, R. Flores, M. Ocaña, M. A. García, I. Parra, D. Fernández, J. E. Naranjo. Ego-motion computing for vehicle velocity estimation. Lecture Notes in Computer Science, 2007. M. A. Sotelo, J. Barriga, D. Fernández, I. Parra, J. E. Naranjo. Vision-based blind spot detection using optical flow. Lecture Notes in Computer Science, 2007. I. Parra, D. F. Llorca, M. A. Sotelo, P. Revenga, L. M. Bergasa, M. Ocaña, J. Nuevo, R. Flores, M. García. Combination of feature extraction methods for SVM pedestrian detection. IEEE Transactions on Intelligent Transportation Systems, 2007 (JCR-IF-2007: 1.689; Q1). M. A. Sotelo, R. Flores, D. Fernández, I. Parra. Vision-based Ego-motion Computing for Intelligent Vehicles. Lecture Series on Computer and Computational Sciences, 2006. I. Parra, D. F. Llorca, M. A. Sotelo, P. Revenga, L. M. Bergasa, M. Ocaña, J. Nuevo, R. Flores. Stereo Vision-based Pedestrian Recognition for ITS Applications. WSEAS Transactions on Information Science and Applications, 2006. D. F. Llorca, H. Corrales, I. Parra, M. A. Sotelo. License plate localization using CNN-based numerical coordinate regression. 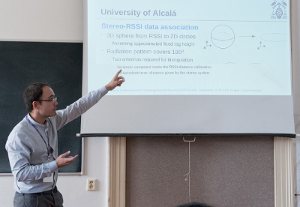 17th International Conference on Computer Aided Systems Theory (EUROCAST 2019). H. Corrales, D. F. Llorca, I. Parra, M. A. Sotelo. Deep convolutional neural networks for fine-grained car model classification. 17th International Conference on Computer Aided Systems Theory (EUROCAST 2019). R. Izquierdo, I. Parra, D. F. Llorca, M. A. Sotelo. Multi-Radar Self-Calibration Method using High-Definition Digital Maps for Autonomous Driving. 2018 IEEE 20th International Conference on Intelligent Transportation Systems (ITSC). N. Hernández, I. G. Daza, C. Salinas, I. Parra, J. Alonso, D. F. Llorca, M. A. Sotelo. Intelligent feature selection method for accurate laser-based mapping and localisation in self-driving cars. 2018 IEEE/RSJ International Conference on Intelligent Robots and Systems (IROS). R. Izquierdo, I. Parra, C. Salinas, D. F. Llorca, M. A. Sotelo. Semi-Automatic High-Accuracy Labelling Tool for Multi-Modal Long-Range Sensor Dataset. 2018 IEEE Intelligent Vehicles Symposium (IV). R. Izquierdo, I. Parra, J. Muñoz-Bulnes, D. F. Llorca, M. A. Sotelo. Vehicle Trajectory and Lane Change Prediction Using ANN and SVM Classifiers.2017 IEEE 20th International Conference on Intelligent Transportation Systems (ITSC). R. Quintero, I. Parra, J. Lorenzo, D. F. Llorca, M. A. Sotelo. Pedestrian Intention Recognition by Means of a Hidden Markov Model and Body Language.2017 IEEE 20th International Conference on Intelligent Transportation Systems (ITSC). J. Muñoz-Bulnes, C. Fernández, I. Parra, D. F. Llorca, M. A. Sotelo. Deep Fully Convolutional Networks with Random Data Augmentation for Enhanced Generalization in Road Detection.2017 IEEE 20th International Conference on Intelligent Transportation Systems (ITSC). D. F. Llorca, M. Jiménez. CNN-based Vehicle Logo Classification for Vehicle Manufacturer Recognition. 3rd Annual International Conference on Transportation. I. Parra, A. García-Morcillo, R. Izquierdo, J. Alonso, D. F. Llorca, M. A. Sotelo. Analysis of ITS-G5A V2X communications performance in autonomous cooperative driving experiments. 2017 IEEE Intelligent Vehicles Symposium (IV). D. F. Llorca, C. Salinas, M. Jiménez, I. Parra, A. G. Morcillo, R. Izquierdo, J. Lorenzo, M. A. Sotelo. Two-camera based accurate vehicle speed measurement using average speed at a fixed point. 2016 IEEE 19th International Conference on Intelligent Transportation Systems (ITSC). D. F. Llorca, R. Quintero, I. Parra, M. Jiménez, C. Fernández, R. Izquierdo, M. A. Sotelo. Fusing directional passive UHF RFID and stereo vision for tag association in outdoor scenarios. 2016 IEEE 19th International Conference on Intelligent Transportation Systems (ITSC). D. F. Llorca, R. Quintero, I. Parra, C. Fernández, R. Izquierdo, M. A. Sotelo. Comparison between UHF RFID and BLE for stereo-based tag association in outdoor scenarios. 6th International Conference on IT Convergence and Security 2016 (ICITCS2016). C. Fernández, J. Lorenzo, J. Alonso, A. García, D. F. llorca, M. A. Sotelo. A Comparison of Road Curb Detection Using Curvature Values from LIDAR and Stereo Vision. 1st Symposium SEGVAUTO-TRIES-CM: Technologies for a Safe, Accessible and Sustainable Mobility 2016. J. Alonso, I. Parra, R. Izquierdo, A. García, M. A. Sotelo, C. Fernández, R. Quintero, C. Salinas, J. Lorenzo, D. F. Llorca. Drivertive Team in the Grand Cooperative Driving Challenge 2016. 1st Symposium SEGVAUTO-TRIES-CM: Technologies for a Safe, Accessible and Sustainable Mobility 2016. R. Quintero, I. Parra, D.F. Llorca, M.A. Sotelo. Pedestrian Intention and Pose Prediction through Dynamical Models and Behaviour Classification. IEEE Intelligent Transportation Systems Conference, 2015 (IEEE ITSC15) -Best Workshop Paper-. D.F. Llorca, R. Quintero, I. Parra, R. Izquierdo, C. Fernandez, M.A. Sotelo. Assistive Pedestrian Crossings by Means of Stereo Localization and RFID Anonymous Disability Identification. IEEE Intelligent Transportation Systems Conference, 2015 (IEEE ITSC15). C. Fernández, R. Izquierdo, D. F. Llorca, M. A. Sotelo. A Comparative Analysis of Decision Trees Based Classifiers for Road Detection in Urban Environments. IEEE Intelligent Transportation Systems Conference, 2015 (IEEE ITSC15). C. Fernández, D.F. Llorca, C. Stiller, M.A. Sotelo Curvature-based curb detection method in urban environments using stereo and laser. IEEE Intelligent Vehicles Symposium, 2015 (IEEE IV15). D. F. Llorca, D. Colás, I. G. Daza, I. Parra, M. A. Sotelo. Vehicle model recognition using geometry and appearance of car emblems from rear view images. IEEE Intelligent Transportation Systems Conference, 2014 (IEEE ITSC14). C. Fernández, R. Izquierdo, D. F. Llorca, M. A. Sotelo. Road Curb and Lanes Detection for Autonomous Driving on Urban Scenarios. IEEE Intelligent Transportation Systems Conference, 2014 (IEEE ITSC14). R. Quintero, I. Parra, D. F. Llorca, M. A. Sotelo. Pedestrian path prediction based on body language and action classification. IEEE Intelligent Transportation Systems Conference, 2014 (IEEE ITSC14). D. F. Llorca, I. Parra, R. Quintero, C. Fernández, R. Izquierdo, M. A. Sotelo. Stereo-based Pedestrian Detection in Crosswalks for Pedestrian Behavioural Modelling Assessment. International Conference on Informatics in Control, Automation and Robotics 2014 (ICINCO 2014) -Best Paper Award Finalist-. R. Quintero, J. Almeida, D. F. Llorca, M. A. Sotelo. Pedestrian path prediction using body language traits. IEEE Intelligent Vehicles Symposium, 2014 (IEEE IV14). A. G. Lorente, D. F. Llorca, M. G. Velasco, J. A. Ramos, F. Sánchez. Range-based rail gauge and rail fasteners detection using high-resolution 23/3D images.Transportation Research Board 93rd Annual Meeting (TRB 2014). D. F. Llorca, R. Arroyo, M. A. Sotelo. Vehicle logo recognition in traffic images using HOG and SVM. IEEE Intelligent Transportation Systems Conference, 2013 (IEEE ITSC13). S. Álvarez, D. F. Llorca, M. A. Sotelo. Camera auto-calibration using zooming and zebra crossing for traffic monitoring applications. IEEE Intelligent Transportation Systems Conference, 2013 (IEEE ITSC13). D. F. Llorca, S. Álvarez, M. A. Sotelo. Vision-based parking assistance system for leaving perpendicular and angle parking lots. IEEE Intelligent Vehicles Symposium, 2013 (IEEE IV13). D. F. Llorca, A. G. Lorente, C. Fernández, I. G. Daza, M. A. Sotelo. Automatic thermographic inspection of buildings envelope using laser and thermal images. International Conference on Computer Aided Systems Theory 2013 (EUROCAST 2013). S. Álvarez, D. F. Llorca, M. A. Sotelo, A. G. Lorente. Monocular target detection on transport infrastructures with dynamic and variable environments. IEEE Intelligent Transportation Systems Conference 2012 (IEEE ITSC12). C. Fernández, M. Gavilán, D. F. Llorca, I. Parra, A. G. Lorente, Lj. Vlacic, M. A. Sotelo. Free Space and Speed Humps Detection using Lidar and Vision for Urban Autonomous Navigation. IEEE Intelligent Vehicle Symposium 2012 (IEEE IV12). A. Orellana, D. F. Llorca, C. Soria, A. G. Lorente. Stereo-based path and obstacles detection in multiannual cultivations for autonomous navigation of an agricultural robot. IEEE Intelligent Vehicle Symposium 2012 (IEEE IV12). I. G. Daza, N. Hernández, L. M. Bergasa, I. Parra, J. J. Yebes, M. gavilán, R. Quintero, D. F. Llorca, M. A. Sotelo. Drowsiness monitoring based on driver and driving data fusion. IEEE Intelligent Transportation Systems Conference 2011 (IEEE ITSC11). M. A. García-Garrido, M. Ocaña, D. F. Llorca, M. A. Sotelo, E. Arroyo, A. Llamazares. Robust Traffic Signs Detection by means of Vision and V2I Communications. IEEE Intelligent Transportation Systems Conference 2011 (IEEE ITSC11). R. Quintero, A. Llamazares, D. F. Llorca, M. A. Sotelo, L. E. Bellot, O. Marcos, I. G. Daza, C. Fernández. Extended Floating Car Data System - Experimental Study -. IEEE Intelligent Vehicles Symposium 2011 (IEEE IV11). I. Parra. M. A. Sotelo, D. F. Llorca, C. Fernández, N. Hernández, I. García. Visual Odometry and map fusion for GPS navigation assistance. IEEE International Symposium on Industrial Electronics 2011 (IEEE ISIE11). S. Álvarez. M. A. Sotelo, D. F. Llorca, R. Quintero, O. Marcos. Vision-based target detection on Critical Transport Infrastructures. International Conference on Computer Aided Systems Theory 2011 (EUROCAST 2011). M. Gavilán, M. A. Sotelo, D. F. Llorca, D. Balcones, O. Marcos, I. García, R. Quintero, C. Fernández. Vision-based applications for Traffic Conditions and Road Surface Quality Assessment. International Conference on Computer Aided Systems Theory 2011 (EUROCAST 2011). E. Del Arco, A. B. Rodríguez, M. Wilby, J. Ramiro, J. J. Vinagre, D. F. Llorca, M. A. Sotelo, J. Ramos, A. J. Caamaño. Cooperative Wireless Sensing for Characterization of Congested Traffic States. IEEE Intelligent Transportation Systems Conference 2010 (IEEE ITSC10). V. Milanés, C. González, D. F. Llorca, M. A. Sotelo, B. M. Vinagre. Clavileño: evolution of an autonomous car. IEEE Intelligent Transportation Systems Conference 2010 (IEEE ITSC10). D. F. Llorca, M. A. Sotelo, S. Sánchez, C. Fernández, J. J. Vinagre, J. Ramiro. Vision-based Traffic Data Collection for Floating Car Data Enhancement. IEEE Intelligent Transportation Systems Conference 2010 (IEEE ITSC10). I. Parra, M. A. Sotelo, D. F. Llorca, C. Fernández, N. Hernández, A. Llamazares. Visual odometry and map fusion for intelligent traffic Management. ITS World Congress 2010. F. Herranz, M. Ocaña, L. M. Bergasa, M. A. Sotelo, D. F. Llorca, N. Hernández, A. Llamazares, C. Fernández. Studying on WiFi range-only sensor and its application to localization and mapping systems. IEEE International Conference on Robotics and Automation 2010 (IEEE ICRA10). S. Álvarez, M. A. Sotelo, D. F. Llorca, I. Parra, M. Gavilán. Vehicle and Pedestrian Detection in eSafety Applications. World Congress on Engineering and Computer Science 2009 (WCECS 2009) -Certificate of Merit-. C. G. Keller, D. F. Llorca and D. M. Gavrila. Dense Stereo-based ROI Generation for Pedestrian Detection. Annual Symposium of the German Association for Pattern Recognition 2009 (DAGM 2009). D. Balcones, D. F. Llorca, M. A. Sotelo, M. Gavilán, I. Parra, S. Álvarez, M. Ocaña. Vision-based vehicle detection for rear-end collision mitigation systems. International Conference on Computer Aided Systems Theory 2009 (EUROCAST 2009). S. Alvarez, M. A. Sotelo, M. Ocaña, D. Fernández, I. Parra. Vision-based Target Detection in Road Environments. WSEAS International Conference on Visualization, Imaging and Simulation 2008 (WSEAS VIS08). P. F. Alcantarilla, L. M. Bergasa, P. Jiménez, S. S. Mayoral, M. A Sotelo, I. Parra, D. Fernández. Night Time Vehicle Detection for Driving Assistance LightBeam Controller. IEEE Intelligent Vehicle Symposium 2008 (IEEE IV08). R. Garcia, M. A Sotelo, I. Parra, D. Fernández and M. Gavilán. 2D Visual Odometry Method for Global Positioning Measurement. IEEE International Symposium on Intelligent Signal Processing 2007 (IEEE WISP07). I. Parra, D. Fernández, M. A. Sotelo, M. Marrón and G. Lacey. Tracking using Particle and Kalman filters in Hand-washing Quality Assessment System. IEEE International Symposium on Intelligent Signal Processing 2007 (IEEE WISP07). D. Fernández, I. Parra, M. A. Sotelo, P. Revenga, S. Álvarez. 3D Candidate Selection Method for Pedestrian Detection on Non-planar Roads. IEEE Intelligent Vehicle Symposium 2007 (IEEE IV07). R. García, M. A. Sotelo, I. Parra, D. Fernández. 3D Visual Odometry for GPS Navigation Assistance. IEEE Intelligent Vehicle Symposium 2007 (IEEE IV07). M. A. Sotelo, D. Fernández, I. Parra, J. E. Naranjo. Improved Vision-based Pedestrian Detection System for Collision Avoidance and Mitigation. IEEE International Conference on Robotics and Automation 2007 (IEEE ICRA07). M. A. Sotelo, R. Flores, M. Ocaña, M. A. García, I. Parra, D. Fernández, E. Naranjo. Ego-motion computing for vehicle velocity estimation. International Conference on Computer Aided Systems Theory 2007 (EUROCAST 2007). M. A. Sotelo, J. Barriga, D. Fernández, I. Parra, E. Naranjo. Vision-based blind spot detection using optical flow. International Conference on Computer Aided Systems Theory 2007 (EUROCAST 2007). D. Fernández, I. Parra, M. A. Sotelo, P. Revenga. Bounding box accuracy in pedestrian detection for intelligent transportation systems. Annual Conference of IEEE Industrial Electronics 2006 (IEEE IECON06). M. Marrón, M. A. Sotelo, J. C. García, D. Fernández, I. Parra. 3-D visual detection of multiple objects and structural features in complex and dynamic indoor environments. Annual Conference of IEEE Industrial Electronics 2006 (IEEE IECON06). J. E. Naranjo, C. Gonzalez, T. de Pedro , R. Garcia , J. Alonso, M. A. Sotelo, D. F. Llorca. AUTOPIA Cybercar Architecture for Automatic Driving and Maneuvering. IEEE Intelligent Transportation Systems Conference 2006 (IEEE ITSC06). M. A. Sotelo, I. Parra, D. Fernández, E. Naranjo. Pedestrian detection using SVM and multi-feature combination. IEEE Intelligent Transportation Systems Conference 2006 (IEEE ITSC06). M. A. Sotelo, R. Flores, D. Fernández, I. Parra. Vision-based ego-motion computing for intelligent vehicles. International e-Conference of Computer Science 2006 (IeCCS06). I. Parra, D. Fernández, M. A. Sotelo, P. Revenga, L. M. Bergasa, M. Ocaña, J. Nuevo, R. Flores. Pedestrian Recognition in Road Sequences. WSEAS International Conference on Signal Processing, Robotics and Automation (WSEAS06). M. A. Sotelo, J. Nuevo, L. M. Bergasa, M. Ocaña, D. Fernández, I. Parra, R. Flores. SVM obstacle recognition for road vehicle applications. International Joint Conferences on Artificial Intelligence 2005 (IJCAI05). (Core A+). D. Fernández, I. Parra, M. A. Sotelo, L. M. Bergasa, P. Revenga, J. Nuevo, M. Ocaña, R. Flores. Pedestrian Recognition for Intelligent Transportation Systems. International Conference on Informatics in Control, Automation and Robotics 2005 (ICINCO 2005). M. Marrón, M. Á. Sotelo, J. C. García, D. Fernández, D. Pizarro. XPFCP: An extended particle filter for tracking multiple and dynamic objects in complex environments. IEEE International Conference on Intelligent and Robots and Systems 2005 (IEEE IROS05). M. A. Sotelo, J. Nuevo, L. M. Bergasa, M. Ocaña, I. Parra, D. Fernández. Road Vehicle Recognition in monocular images. IEEE International Symposium on Industrial Electronics 2005 (IEEE ISIE05). M. Marrón, M. Á. Sotelo, J. C. García, D. Fernández, D. Pizarro. XPFCP: An extended particle filter for tracking multiple and dynamic objects in complex environments. IEEE International Symposium on Industrial Electronics 2005 (IEEE ISIE05). M. A. Sotelo, D. Fernández, J. E. Naranjo, R. García, T. De Pedro, C. González, J. Reviejo. Vision based adaptive Cruise Control for Intelligent Transportation Systems. IEEE International Conference on Intelligent and Robots and Systems 2004 (IEEE IROS04). M. A. Sotelo, D. Fernández, J. E. Naranjo, C. González, R. García, T. De Pedro, J. Reviejo. Laser-based adaptive cruise control for intelligent vehicles. International Conference on Informatics in Control, Automation and Robotics 2004 (ICINCO 2004).